Coloured Barfi recipe by Farah (Sydney Australia) at DesiRecipes.com. Boil some water then add sugar and let that boil and get into a browny texture. While your syrup is being cooked mix few table spoons of ghee in the powdered milk and use both hands to mash it to make the ghee dissolve in the powdered milk to give it a pure colour. Mix some ilachi into the powdered milk and ghee . Meanwhile keep stirring the sugar syrup and see if the water dries up a little and its turning into a texture of honey . It has to be slightly like a honey not so sticky as it will be still runny type of syrup. Now turn off the stove. 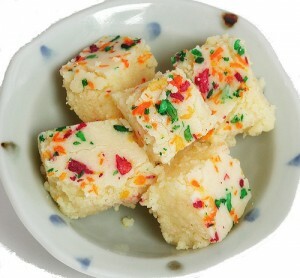 Use a large wide spoon and stir in the syrup mixing your barfi. Grab a big tray and spread the barfii all over tray while pressing down then sprinkle some rainbow coloured smarties to give it a festive colour or some nuts of your choice. Set it in the fridge for hour or so, when its ready cut into small pieces. Yes we believe the quantity given above for milk powder, ghee and water is correct for the recipe. its exactly how much powdered milk , ghee and water ?? thank u vry mch 4 ur reply.